Impractical Jokers star Joe Gatto is truly a proud family man. For Gatto, family life comes at first and it goes the same for his wife Bessy Gatto. The couple who tied the knot in 2013 are now parents to two adorable kids. He has a huge net worth and salary. 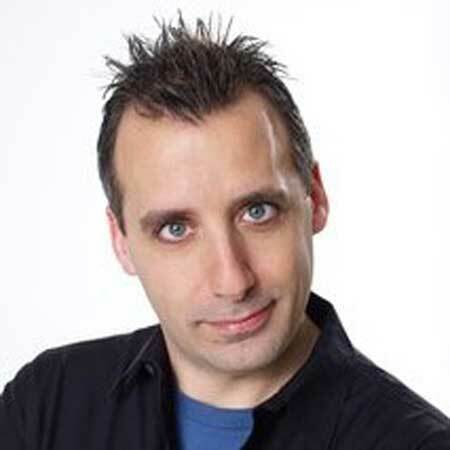 .A person who has a good sense of humor and perfect comedy timing is loved a great deal and, no doubt, Joe Gatto is the one. Impractical Jokers star Gatto is truly a proud family man. For Gatto, family life comes first and it goes the same for his wife Bessy Gatto. The couple who tied the knot in 2013 are now parents to two adorable kids. The funniest guy in truTV hasn't revealed much about his personal life. Still, let's get to know more about him and his family life in today's session. What else matters the most in life than a loving wife and adorable kids around all the time? We can say that actor and comedian Joe Gatto is truly a blessed person with both personal and professional bliss. Jue Gatto and his soulmate Bessy Gatto have been living a wonderful life as lawful husband and wife for as long as five years and they have miles to go. He tied the knot to the gorgeous lady on 2nd September 2013. Though there's not much information revealed about his family life, it's crystal clear that Bessy is very supportive of her husband. The Gatto’s are here with @bestfriendsanimalsociety for #strutyourmutt #adoptdontshop - come by!!! "Make room girls! Baby brother Gatto will be crashing our tea party this summer #ahumannotapuppy #babynumber2." He couldn't seem much happier than the moment when he became a father for the second time with Remington Joseph Gatto born on 31 July 2017. Here's my son Remington Joseph Gatto. Or as we call him, Remo. Thanks for all your thoughts. Mom & baby are doing well. Hold on tight buddy, it's gonna be a hell of a ride. "I’m excited he’s finally here. [My daughter] Milana made me love being a dad so imagine it’ll now be twice as fun." We can barely explain how much he's attached to his lovely wife and two children. You can simply guess by looking at his Instagram all filled with his family members. A gorgeous wife, a couple of kids, and a number of dogs simply completes his family. Not yet..... #christmaseve Hope everyone is enjoying their day as much as I am. The couple celebrated Christmas 2018 in a wonderful way with their children and also welcomed New Year 2019. Before fame, Gatto worked at the baby retail store named 'Giggle' until January 2011. In 1999, he organized a comedy troupe 'The Tenderloins' with his high school friends James Murray, Mike Boccio, and Sal Vulcano. Sources reported that the group won the $100K grand prize in NBC’s It’s Your Show competition before launching their show. The troupe gained wide popularity when it was shaped into a TV series Impractical Jokers on TruTv. The hidden camera reality series produced by NorthSouth Productions premiered on 15 December 2011. In March 2018, TruTV announced that the eighth season of the show is expected to air in February 2019. Furthermore, TruTV added that an Impractical Jokers feature-length movie is planned to air the same year as the part of the show's 8th season as the movie already began its productions in spring 2018. Born on 5 June 1976 in Staten Island, NY. He studied at Monsignor Farrell High School. His father Joseph Gatto died of pancreatic cancer in 1995. He completed his graduation from Long Island University with a degree in Accounting. He founded The Tenderloins comedy troupe with James Murray, Sal Vulcano, and Mike Boccio in 1999. In 2014, he appeared on TV series Jokers Wild.